If you lived in a dystopian science fiction movie, what would be your first clue? The rise of an authoritarian leader? Battles in the streets over scarce resources? Personally, I think the very first clue might be when brands are buying ad space from the police. And if I’m right, I’ve got some bad news for you. 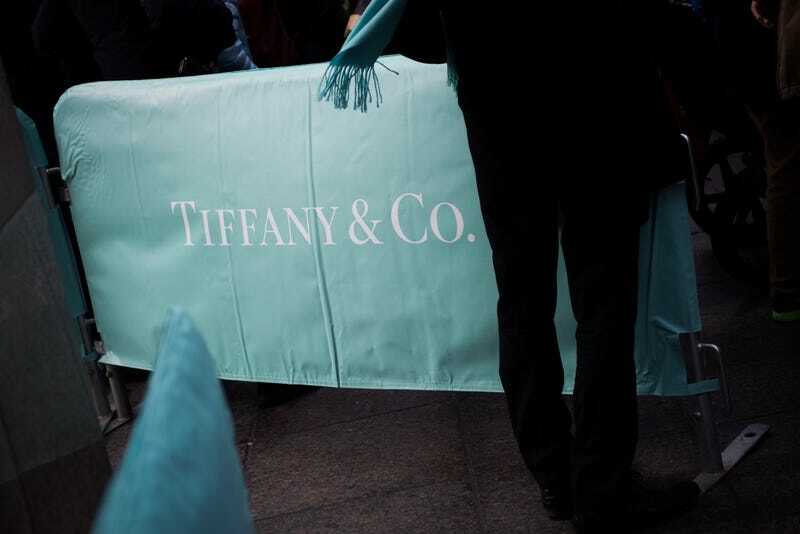 Lately, Tiffany & Co. has been frustrated with the decline in foot traffic near its Fifth Avenue store in New York. The store is just one door down from Trump Tower and ever since Trump was elected, sales have been way down. The incredibly large security presence from both the Secret Service and the NYPD has apparently caused fewer people to shop at the iconic, high-end retailer. So what’s the solution, according to Tiffany’s? Put branded covers over the security barriers nearby. WWD reports that Tiffany’s has been working directly with the NYPD to get more attention for their store. And that includes putting Tiffany’s-branded coverings over the barricades meant to restrict where people can walk near Trump Tower. The details of the arrangement haven’t been disclosed, but Tiffany & Co. acknowledges that it’s working with NYPD and the Secret Service. Advertising often times plays an important part in dystopian sci-fi movies. Various TV, radio, and billboard ads are placed inside an unfamiliar universe as a way to ground the viewer into a reality that modern audiences will recognize as home. Minority Report famously had specialized ad-targeting based on reading a consumer’s iris. Blade Runner had gigantic video billboards hawking Coca-Cola. Children of Men had ads for suicide pills for when you finally decided you couldn’t take it anymore. And our own sci-fi dystopia, known as 2016, has Tiffany’s-branded security barricades. Tiffany & Co. isn’t the only retailer using tools of the national security state for advertising purposes, of course. I recently flew out of the Los Angeles International airport and couldn’t help but notice that my TSA bin had an ad for Snapchat’s Spectacles. I’ve seen ads in the TSA bins before, but this was the first time I’d seen one for a hot, new tech consumer product. At this point we should probably start taking bets about what arm of our national security apparatus will get corporate branding next. Will customs and immigration officers start stamping your passport with an Instagram ad? Will Trump’s new border wall along the US-Mexico border get gigantic billboards for Trump steaks? Only time will tell. But this feels like roughly the beginning of something very, very bad. Welcome to the future.